The recipe for success: Give transit agencies the resources to make systemwide improvements, don't just focus on one line at a time. American cities should start thinking a lot harder about how they’re going to get people back on the bus. Transit ridership is falling in 31 out of 35 major U.S. transit markets. There’s no shortage of challenges for transit right now: cheap gas, cheap car loans, and cheap ride-hailing apps all exert a pull, tugging at people to choose a car instead of a bus or a train. But that’s no excuse for failing to make transit an effective travel option that gains more riders. Despite all the factors working against transit, a few cities have managed to buck the trend and grow ridership, and other cities should learn from their example, according to the experts at TransitCenter. The cities toward the top of this list are doing a few big things right, says TransitCenter’s Zak Accuardi. Here’s how he describes the recipe for growing ridership, even in a challenging environment. This is not exactly surprising, but the places where more people are choosing to ride transit have made significant investments in transit. Seattle and King County operate 13 percent more transit service today than in 2014, after bringing light rail expansions online while adding bus service. Those improvements were funded by ballot measures to raise revenue for transit. The effects of a huge 2016 transit ballot initiative have yet to even register. In Phoenix, the other high performer, voters approved a sales tax hike in 2015 to fund $31 billion in transit upgrades. More than half the revenue is dedicated to bus improvements, and increased service is already paying off with higher ridership. Of course, simply spending resources on transit doesn’t mean you’re spending them well. What distinguishes cities that are bucking the trend, says Accuardi, is their emphasis on the whole system, not just improving or adding one route at a time. Seattle and Phoenix, for instance, both implemented substantial increases in bus service as they planned long-term investments in light rail lines. Houston, one of the better performers, has not only added light rail routes in recent years, it’s also completely redesigned its bus network, emphasizing the provision of frequent service to more neighborhoods and beefing up weekend service. Columbus, another city that recently overhauled its bus network, is also outperforming its peer cities in transit ridership, says Accuardi. While Columbus and Houston are doing relatively well, the ridership changes in 2017 weren’t exactly impressive either. Neither city increased its bus service budget as part of its network redesign. Without devoting resources to increased service, there’s only so much that adjustments to the network can do, said Accuardi. 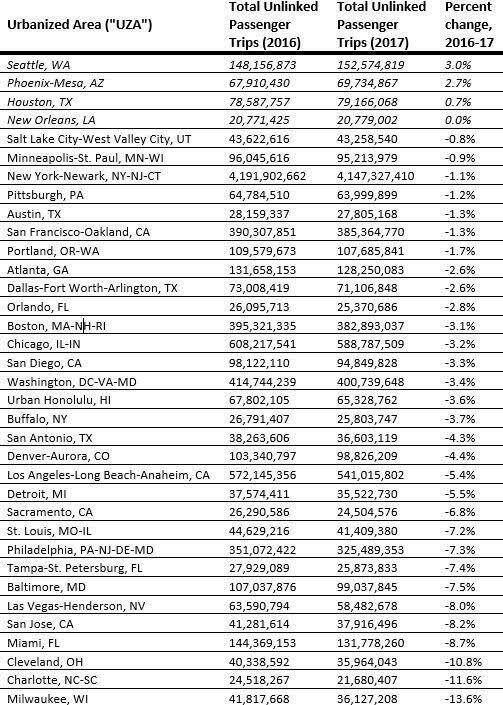 Although the regional 2017 numbers in the table above don’t make it very clear, another city that’s gaining riders thanks to systemwide improvements is San Francisco — specifically Muni, the agency run by the city. Muni Forward aims to improve bus speed and reliability throughout the system. San Francisco was the first major American city to implement citywide all-door boarding, and the Muni Forward program continues add features like bus lanes and walkability improvements near transit stops. That kind of approach is “the only thing we can point to really clearly to say, ‘This is how you grow transit ridership,'” said Accuardi. Of course we all want to get in our car and go to where we want to go when we want to. And indeed that is by and large the suburban reality. In the suburbs people prefer driving to other modes because the other modes usually take so much longer. Unless it’s to our neighbor down the street then we prefer to walk. It’s a big hassle to open the garage, get in the car, driver it 300 feet, park it and get out, even if it were to save us 30 seconds or even a 90 seconds, which in many cases 300 feet walked would actually be faster. We prefer to walk because it is more relaxing than driving. Even for short distances driving has stress. Mostly unnoticed because it is such a small stress. Whereas the process walking is actually relaxing in and of itself. That’s why many people enjoy walking just for fun. But you are talking of the longer distances. Because that what suburbs allow and create. Greater distances between neighbors and stores and jobs. So driving is not only preferred it is required. And things that are required are no longer the essence of a free society as you say. Freedom requires choices. If my only choice is to need a car to live well, then that is no longer a free choice. And that’s one of the reasons that cities are so popular. If I choose my neighborhood well I will have several choices available to get to where I want to go be it visiting, shopping or working. I am not forced to own a car. I can still own one though if I want. And sometimes a car in the city is not the preferred way to travel. Sometimes it’s just too much trouble to use. That’s actually a feature not a bug. See, so having both suburbs and cities is a form of freedom. Freedom to choose the lifestyle you want. That’s why government or corporate forcing of cars down city dwellers throats is so anti supply and demand. If we turn our cities into being like suburbs then there is no choice any more. What a city is is a place where a lot of people want to go to at the same time pretty much all day. So no you can’t build a city like a sports stadium. And the closer people want to be, the more the car gets in the way. Especially the streets and highways that cars need to operate within. As for guilt and virtue signalling, I really can’t speak to those concepts. They sound interesting but my guess is that they are kinda bogus ideas without much reality behind them. But that’s not my problem. Good luck if it is yours. Evan, your numbers are way off. No way transit moves 48% of people. Second, it’s $0.50/mile for cars (AAA), so your 6-mile trip is $3. Average bus operating subsidy/rider is about $4-$5 on the west coast. The 48% stat is for central Seattle, where I work. I already provided the source. The $7/trip difference in your estimate and mine is mostly from parking. Parking anywhere near my work is more than $300/month. Divide that by 20 working days and you get an extra $15+/day to add to your $3. true for our area. The average King County bus costs something around $220/hour—I don’t have the exact number in front of me at the moment. Based on that bus’s capacity and the standard adult fare, a full bus is making money for the system. In rural areas, cars are more cost-effective than buses, so buses there generally function as part of the safety net rather than as a truly competitive alternative. Most suburbs were designed from the ground up for cars, so it isn’t surprising that they would be work better than transit in those areas. In cities, however, cars become ludicrously inefficient at the same time that transit becomes highly efficient, and it takes an extensive system of subsidy and regulation to keep cars as an attractive option in those areas. Evan, Seattle seems to be a one-off situation for US transit. But it comes at a price. 60% of Metro riders get free transit… paid by their employers. I’ll be most of that is bus. My guess is many of those riders drive in from the suburbs and then take Metro the last “mile” (longer than a mile). I’m not knocking the Seattle Metro. I have no idea of the details. The article I list below is trying to apply Seattle to Nashville. 8k vs. 1k residents per square km (wiki). Density is key… and not just for a spot or two. The whole city (and a bit beyond). That’s the problem. Everyone thinks a NY subway will work in their city (e.g. Honolulu). And then the cost of the subway/train kills the rest of lower-cost metro service. BTW, the ORCA Passport program only requires employers to cover a minimum of 50% of the pass. Some people have their passes fully paid for, others have to chip in through paycheck deduction. I couldn’t agree more. For two months in 2018, I used Uber, the LA metro trains (Gold and Red Lines) as well as a bus to get to a gig in West Hollywood. I observed significant crowds on both the train and bus portions of my commute. For a few weeks out of this two month experiment I drove my own vehicle. Commute times were the same, and with the transit option at least I didn’t feel the stress of driving. I think the layout and design of a city has significant impact on quality of transmit services. What’ll work for a standard grid layout city won’t work as well for an olive branched layout. Having said that, I think it’s possible to figure it out everywhere, but every area is very unique. Seattle is showing other American cities how transit can help a growing population get around without an increase in car traffic. How Can Transit Agencies Win Back Their Riders? Subprime auto loans, gentrification and, yes, Uber and Lyft are hurting transit ridership. But a new TransitCenter survey says better service can win them back.